By Peter Anderson 3 Comments - The content of this website often contains affiliate links and I may be compensated if you buy through those links (at no cost to you!). Learn more about how we make money. Last edited September 10, 2015 . I recently participated in an episode of the Money Mastermind Show that talked about the topic of networking, and how it can help your career. I'll admit that at first I didn't think I would have much to say about the topic, as I've been at the same day job for 16 years now and haven't had to use my contacts to find a new job. I quickly realized, however, that networking is about much more than just cultivating contacts to help find a new job. While I may not have used networking to find a new job (which for most people is one of the main reasons to network), I have used it at my current job to help me to learn more about my industry, to gain valuable knowledge from others who know more than I do, as well as using online networking through my websites and social media to gain some valuable friendships and working partnerships. So today I thought I'd go into some of the reasons why you should consider networking, and how it can help your career. But first, here's the aforementioned show that talks about how networking can help your career. It includes a myriad of networking tips from attendees at the 2014 FinCon Expo. If you're not especially fond of the idea of networking, it may be hard to get yourself up to go to a networking event. Here's a few reasons why you may want to consider doing it anyway. Networking can lead to higher paying positions: Networking can lead to a higher paying position, even if it is within your own company. Knowing the right people, and cultivating the right skills can lead to promotions and raises! If you've been laid off, networking can help you too find a new position: If you've been laid off from or would like to leave a job, networking can help you to find a new position, even for positions that haven't been advertised yet. Getting to know people in your field can mean you'll be top of mind when new positions open up. 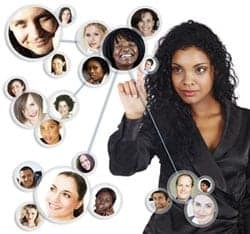 Word of mouth advertising with others in your industry – the more people who know you, the more likely you are to be successful: When you become a staple at industry mixers or meetups, people will remember you, and you'll be top of mind when they are hiring, or looking for someone with your expertise. Have your own business? 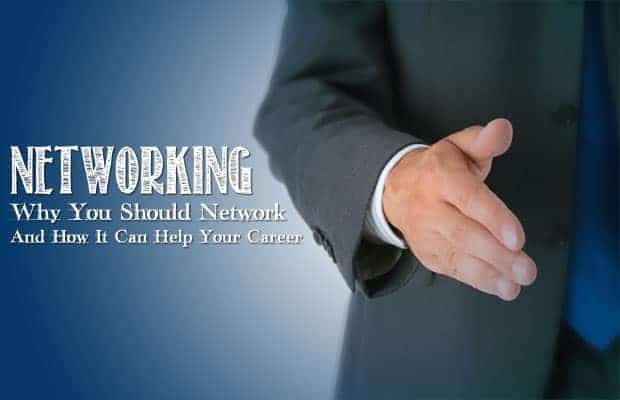 Networking at industry events can help you to find work for your company. Hook you up with a mentor, or be a mentor: Networking can help you get hooked up with people in the know in your industry. Many would be more than happy to share valuable knowledge that they've learned over the years with you. There are a lot of people in your industry with a ton of knowledge – look to create relationships with some of them to help grow your own knowledge! If you've been in the industry for a while, look for opportunities to help others, and to possibly be a mentor yourself! Peer learning: Networking with others can lead to some good learning opportunities. Often your peers can fill you in on what the latest industry news is, the newest software tools, or maybe even what some of the hottest things coming down the pipe are going to be. Attending networking events isn't always easy, but in the long run it is worth it. You can find inspiration and gain knowledge and from others in your industry, and in the long run your career prospects will get a boost. Conferences: You can attend conferences that are related to your industry to network. For example, I'm a personal finance blogger and the best peer conference for finance is the FinCon Expo. I'd love to be able to go every year, but I've been able to attend the conference twice now. Both years lead to quite a few great contacts, learning about the industry as well as a decent amount of revenue for my sites. Community events: Sometimes there will be industry professional groups that will hold local community events. Keep an eye out for events that you can attend and network at. Local meetups and groups: I'm a part of a local bloggers meetup group here in the Twin Cities. It's a great place to get together with other bloggers, and share useful information. 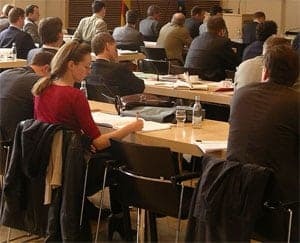 Educational events: A lot of industry groups will hold education events where you can go and learn about some of the newest software, industry trends/etc. They can also be a great place to network and meet people in your field. Host an event: If you don't have any local events or meetups, you could get the ball rolling yourself and host an event at a local restaurant or co-working space. I've helped to host a couple of events in my area, and it can be a great way to build your own reputation amongst others in the industry. In your workplace: You can network with others in your workplace who work in similar areas and specialties. Often they can help to give you a leg up when it comes to promotions and pay increases, as well as helping out if they end up going elsewhere. There is no shortage of places that you can go to find networking opportunities. It just comes down to doing a bit of research, finding events or meetups, and then going. What if you're not a natural networker? What if you're an introvert like me? What are some tips for networking that can help you be more successful? Be an active networker, be ready and prepare yourself to network: Don't just be a wallflower, sitting sipping a drink on the side of the room. Take some time to prepare things you'll talk about with people, and even come up with some people you want to talk to. Take notes when you network, or else you'll forget: When you're talking to people don't forget to take some brief notes about what you talked to them about, who they are and what company they work for. You'll be glad you did later. Use social media to network: It's often easier to interact with people in the know and with power online. I've personally used Twitter to my advantage to meet and chat with CEOs of financial companies, network with other bloggers and interact with others in the financial sector. It has probably been one of my most effective networking tools. Be genuine: If you're going to a networking event, just be yourself. Don't feel the pressure to sell yourself or to sell your company. Just be yourself and be prepared to talk about the things you know about. People can smell a fake a mile away. Bring business cards: I know a lot of people think business cards are useless these days, but I think they still are useful to a degree. Bring some cards, you can get a ton of them for free if you want, and then hand them out. Take notes on the cards that people give to you so you remember who they are. Know what you do and be ready to share it in a non-salesy way: Have an elevator pitch ready for your business, and be ready to share it, but without sounding too over-rehearsed or salesy. Just tell people who you are, and what you do. Listen. Be interested, not interesting: Remember that networking isn't all about telling everyone who you are and what you do. It's also about listening and being interested in others and who they are – and what they do. If you're only interested in what they can do for you, people will quickly feel that out and will want to move on to the next person. Smile: People often get stressed and pre-occupied with interacting with others at these events, and forget the simplest way to engage with others – just smile -and be friendly. Everyone loves to see a friendly face at these events. Find a partner: If you're one of those people who find networking to be a little tough, seek out a friendly face in the crowd – one of those extroverted people – and befriend them. It's often more fun to network when you're doing it with a friendly face (and often one who's better at small talk than you). Arrive early for networking events: Less people, less stress in talking for introverts – and you'll be able to actually engage before the hustle and bustle of the event. Make sure people leave knowing who you are, what service/skills you provide, and how to get a hold of you: Make sure that people know some basics about you when they leave your presence. Make sure they know who you are, what you do and how they can reach you. Creative business cards are good for this. Follow up with the people you meet: Don't forget to follow up with the people that you meet – that you hope to have an active networking relationship with. For many people as soon as they leave an event they feel like they're done with the networking – but really it is only the beginning. Follow up with a helpful link you promised someone on an industry topic, or just send a note to say how much you enjoyed meeting that person. Extend an offer of help in a situation they're dealing with. These are just a few of the tips I've come across on how to make your networking more effective. Have your own? Leave us your tip in the comments! When it comes down to it networking is all about being genuine and creating relationships with other people. You have to go in with the mindset that you're doing this not to take advantage of other people for your own gain, but instead that you're going in to make some new friendships, to help others where you can and down the road possibly to have an in with people in your industry who can help you when you need it. Keep your motives unselfish and you'll end up a networking success – and you may even make a few good friends like I have! Have your own networking tips? Tell us in the comments! Yes, yes yes! I am actually in the early stages of writing a book on networking. I especially like your recommendation that people start their own networking groups. A friend has had enormous success starting a group called Young Professional Women of Toronto. So many opportunities can come up that way, and it’s really not that difficult to do, it’s just going out on a limb. You just never know what opportunities are going to come because of who you know. I’m beginning to believe more and more that knowing people is the key to moving ahead in life/career. That was a big takeaway I learned at FinCon14…incredible conference and networking opportunity. A tweak on one of the points above, and I wish I recalled where I learned this so that I could give appropriate credit where it is due. The saying used to be that ‘It’s not what you know, it’s who you know.’ I would argue that it is not just who you know but also what they think about you. If they know you and don’t like you then they are not useful to your pursuits and actually could be damaging. Previous Post: Should You Always Do What Makes The Most Financial Sense? Next Post: Do Our Shortened Attention Spans Cause Us To Spend More Money?